Black chokeberry (Aronia melanocarpa) isn’t exactly a household name. A select group of researchers in Poland are trying to change that and with good reason. At least five studies conducted over the past decade suggest that A. melanocarpa extracts may be the medicine of the future for patients living with metabolic syndrome. Anthocyanins, a class of antioxidants found in black chokeberries, appear to counter various pre-diabetic and pre-heart disease related risk factors associated with metabolic syndrome. A daily dosage of 300 mg of black chokeberry anthocyanins (100 mg / thrice daily) has been shown to: improve circulation, increase antioxidant enzyme levels and reduce numerous cardiovascular and diabetic threats including high blood pressure, fasting glucose, LDL cholesterol and triglycerides. At the moment, the availability of black chokeberry extract is somewhat limited. However, the need to find effective and safe options for metabolic syndrome is growing at a fast clip. This may provide the perfect circumstance to introduce this obscure berry to a wider audience. J Med Food. 2015 May 14. Beneficial Effects of Polyphenol-Rich Chokeberry Juice Consumption on Blood Pressure Level and Lipid Status in Hypertensive Subjects. Epidemiological studies have shown a positive association between intake of foods rich in antioxidants and lower incidence of cardiovascular disease development. Polyphenols are considered the most abundant and important dietary antioxidants. The aim of this study was to evaluate effects of polyphenol-rich chokeberry juice consumption on 24-h ambulatory monitored blood pressure (BP) level in subjects with no pharmacologically treated high normal BP or grade I hypertension. Twenty-three subjects (12 men and 11 women) aged 33-67 were enrolled and instructed to consume 200 mL of juice daily for 4 weeks. Participants were divided in two groups, based on prevalence of sympathetic or parasympathetic activity. Measurements of biochemical parameters and heart rate variability analysis were also applied. At the end of the intervention period, average 24-h and awake systolic and diastolic BP were significantly decreased (P<.05). This was more pronounced in the group with prevalence of sympathetic activity. Significant reduction in triglyceride level (P<.05) and a reducing effect on total and low-density lipoprotein cholesterol were also found. Obtained results indicate a positive impact of regular chokeberry juice consumption on BP and lipid status in pharmacologically untreated hypertensive subjects. J Int Soc Sports Nutr. 2014 Oct 1;11(1):48. Effect of supplementation with chokeberry juice on the inflammatory status and markers of iron metabolism in rowers. BACKGROUND: The aim of this study was to analyze the effect of supplementation with chokeberry (Aronia melanocarpa) juice on the levels of pro-inflammatory cytokines, hepcidin, and selected markers of iron metabolism in rowers subjected to exhaustive exercise. METHODS: This double-blind study included 19 members of the Polish Rowing Team. The subjects were randomly assigned to the supplemented group (n = 10), receiving 150 mL of chokeberry juice for 8 weeks, or to the placebo group (n = 9). The participants performed a 2000-m test on a rowing ergometer at the beginning and at the end of the preparatory camp. Blood samples were obtained from the antecubital vein prior to each exercise test, one minute after completing the test, and after a 24-hour recovery period. The levels of hepcidin, interleukin 6 (IL-6), tumor necrosis factor alpha (TNF-alpha), ferritin, iron, uric acid, and myoglobin were determined, as well as the total iron-binding capacity, unbound iron-binding capacity, and total antioxidant capacity (TAC). RESULTS: Post-exercise, there was a significant increase in IL-6 and a significant decrease in the TAC in both groups, prior to and after supplementation with chokeberry juice. At the end of the experiment, the supplemented athletes showed significantly lower post-exercise levels of TNF-alpha and significantly higher TACs and iron levels than the controls. 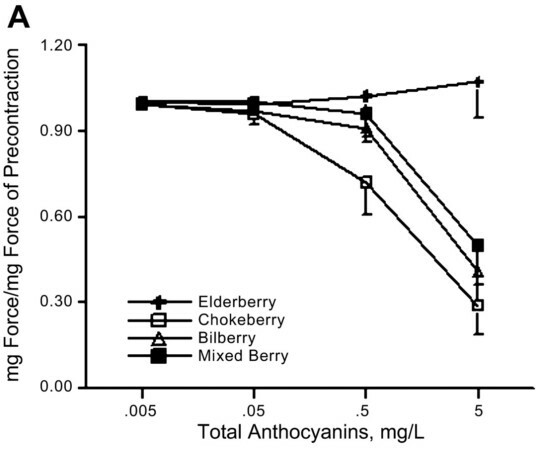 CONCLUSION: Supplementation with chokeberry juice results in an increase in the antioxidant activity of plasma and contributes significantly to reducing the TNF-alpha level. Black chokeberry juice (Aronia melanocarpa) reduces incidences of urinary tract infection among nursing home residents in the long term–a pilot study. Can J Physiol Pharmacol. 2016 Apr 12:1-6. The effects of polyphenol-rich chokeberry juice on fatty acid profiles and lipid peroxidation of active handball players: results from a randomized, double-blind, placebo-controlled study. The effect of polyphenol-rich chokeberry juice consumption on plasma phospholipid fatty acid profiles of 32 active male and female handball players was examined. This randomized, double-blind, placebo-controlled study was conducted during the preparatory training in a closed campus, where 18 players (8 males, 10 females) consumed 100 mL of chokeberry juice, while 14 players (7 males, 7 females) consumed placebo. Lipid status, glucose, thiobarbituric acid reactive substances (TBARS), and percentages of fatty acids were assessed at baseline and at the end of the study. Consumption of chokeberry juice induced decreases of C18:1n-9 and C18:3n-3 in men, but no changes in female players. However, placebo-controlled groups had reduced proportions of mono- (C16:1n-7, C18:1n-7) and polyunsaturated fatty acids (PUFAs: C18:3n-3, C20:5n-3, and C22:4n-6) in males, as well as n-6 PUFAs and total PUFAs in females after consumption. These results indicate that chokeberry juice had a weak impact on attenuating the effect of intensive training in active handball players. Nutr Res. 2016 Sep 14. Consumption of chokeberry (Aronia mitschurinii) products modestly lowered blood pressure and reduced low-grade inflammation in patients with mildly elevated blood pressure. Previous studies suggest that consumption of chokeberries may improve cardiovascular disease risk factor profiles. We hypothesized that chokeberries (Aronia mitschurinii) have beneficial effects on blood pressure, low-grade inflammation, serum lipids, serum glucose, and platelet aggregation in patients with untreated mild hypertension. A total of 38 participants were enrolled into a 16-week single blinded crossover trial. The participants were randomized to use cold-pressed 100% chokeberry juice (300 mL/d) and oven-dried chokeberry powder (3 g/d), or matched placebo products in random order for 8 weeks each with no washout period. The daily portion of chokeberry products was prepared from approximately 336 g of fresh chokeberries. 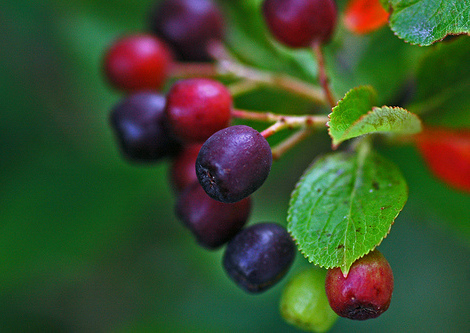 Urinary excretion of various polyphenols and their metabolites increased during the chokeberry period, indicating good compliance. Chokeberries decreased daytime blood pressure and low-grade inflammation. The daytime ambulatory diastolic blood pressure decreased (-1.64 mm Hg, P = .02), and the true awake ambulatory systolic (-2.71 mm Hg, P = .077) and diastolic (-1.62 mm Hg, P = .057) blood pressure tended to decrease. The concentrations of interleukin (IL) 10 and tumor necrosis factor α decreased (-1.9 pg/mL [P = .008] and -0.67 pg/mL [P = .007], respectively) and tended to decrease for IL-4 and IL-5 (-4.5 pg/mL [P = .084] and -0.06 pg/mL [P = .059], respectively). No changes in serum lipids, lipoproteins, glucose, and in vitro platelet aggregation were noted with the chokeberry intervention. These findings suggest that inclusion of chokeberry products in the diet of participants with mildly elevated blood pressure has minor beneficial effects on cardiovascular health.